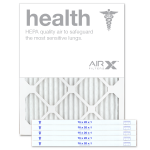 If you want to the ultimate solution to air quality concerns in your home, this is the air filter for you! The charged synthetic media in the filter attracts and captures very small particles that can irritate your lungs. We offer a convenient shopping experience with air conditioner filters and furnace filters in your size. We'll deliver your filters right to your front door!